When it comes to organising a hen party, there is a belief that it must be an expensive affair; after all, who doesn’t want a bit of pampering on their last night of freedom? However, just because a hen party is planned on a budget doesn’t mean that it can’t still be opulent. Read on for our best tips on planning a cheap hen party that comes across as anything but. DIY décor is a fun and fancy way to save money when planning a hen party. Instead of spending silly amounts of money on banners, deely-boppers and balloons, grab some friends and a pair of craft scissors before getting to work! DIY decorations are also an excellent way to personalise the hen party and give it a unique touch. Explore Pinterest for some design ideas and order craft supplies in bulk from Amazon or somewhere similar. 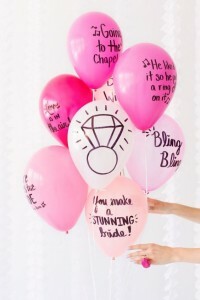 With enough attention and effort put into creating the décor, a cheap hen party can look a million bucks. Instead of booking in somewhere for a fancy meal, why not get everyone to bring a dish and have a potluck? This way there’s lots of choice for even the pickiest of eaters, and if everyone cooks something then there will be plenty of food to go around. Dinners can be expensive and even a two-course meal in a restaurant can break the budget for some people. Self-catering parties are an excellent way to save a few euros and open up the budget a little bit. Booking everything by yourself can end up sabotaging your budget. Booking with an organiser is a handy way to ensure you get the best of everything at the lowest prices. Here at Henit, we will put in the best of effort to help you organise a cost-conscious, cheap hen party. We have packages to suit every kind of price plan, as well as an efficient online-payment system. We also offer Slab It wristbands, which entitles the wearer to complimentary drinks in selected pubs and bars. When booking with Henit, complimentary finger food is on offer in the venue of your choice as well. Gratis stuff is always good for a budget-conscious party! When planning a cheap hen party, transportation is an important factor budget-wise. Transport can be costly if you’re not careful. When it comes to pretty much any event, carpooling is probably the most budget-friendly method of transportation. Depending on the size of your group, you’ll only need a handful of designated drivers and if everybody pitches in for fuel, you’re sorted! Going abroad for hen parties is becoming more and more popular as time goes on, however in the current economic climate jetting off to the middle of Europe for the weekend just isn’t financially realistic for a lot of people. Ireland has heaps of fabulous destinations for hen parties, with myriad things to do and see from one end of the island to the next. Staycations are perfect for a cheap hen party, and are a great way to escape from the norm and mix it up without blowing your whole budget on planning a foreign trip. If you’re stuck for ideas on where to go, have a gander at our list of Ireland’s top hen party destinations for some inspiration. Mullingar is an excellent hen party destination. Different accommodation styles will obviously suit different budgets, so it’s worth shopping around before settling on that expensive 4-star hotel. A B&B or self-catering apartment/house will most likely suit smaller budgets, and if you’re trying to save money when organising the party then these are your best options. While accommodation is an important feature of a hen party, there’s no real point in spending an arm and a leg on a night in an upscale hotel when, chances are, you’ll only be there to shower, get dressed and sleep. Pick somewhere comfortable, cost-effective and best suited to you and your group. While this may seem a little bit like common sense, we’re all guilty of procrastinating things or putting things on the back burner until absolutely necessary. However, taking things slow when planning a hen party can have some dastardly effects on your dough supply. Leaving it until last-minute means rushing around, taking the first price offered on activities, accommodation etc. and leaving you all out of pocket. Booking early ensures a leisurely amount of time to pay up for everything, as well as enabling you to shop around for the best deals. Even simpler; book with Henit and we’ll shop around for you! When booking with us, you have up until three weeks before the party to pay everything off, leaving you with lots of time to save if you’ve booked early enough. So what are you waiting for? Time to get moving, ladies!